Mr. Wise Owl is oh so smart! He has just graduated and received his diploma. His tassel is perfectly glittered in gold. 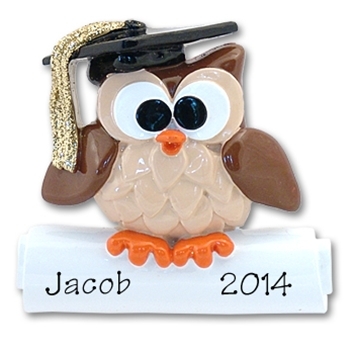 This is a great gift for any graduate! Makes a great teacher's gift too. May be personalized with a name and year. Hand painted and made of RESIN, it is designed by Debi Allison. Comes complete with hook and satin ribbon for hanging.